2 leadcore, I wire for slide diver, 1 mono for dipsy,. Should I throw in a 300 copper? 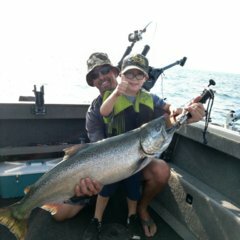 Also have 2 rigs for jigging Lakers. Thanks all help appreciated! No mono on a dipsey ... doesn't work well. You do not want a stretchy line on dipsey. Rather go with braid, better yet, another wire. Got my 300 copper spooled today. Won't braid be bad for fleas? Yes the flees love braid. Go with wire for the dipsey just keep inspecting it for pig tails and kinks. Ok. So how many feet of braid do I need? If you put some mono leader on your wire and copper rods it makes them break down nice for storage. I use 50# leader on my wires for my dipsys and 20# on my copper. I use a spro swivel in between. I don’t use any snubbers. It depends on the user. I think I get more hookups without them. I use the Dteam Weaver rip cord and haven't had any problems with it.